Once you have decided to move forward with divorce and the necessary paperwork has been filed with the court to initiate your case, the next step in the process will be to serve your ex with a copy of the divorce papers. An experienced Littleton divorce lawyer explains some of the most important things to know about serving divorce papers in Colorado. Contact us for the best Colorado divorce representation. Giving your ex a chance to answer or respond to the filing. There are some specific rules that have to be followed when serving divorce (or other legal) papers to someone, and we’ll point out what you should know about the service process below. When, however, you are ready for the best Colorado divorce representation, don’t hesitate to contact a trusted Littleton divorce lawyer at Bahr & Kreidle. Methods of service – There are two ways to serve divorce papers in Colorado: via personal service (or hand delivery) or via certified mail (with a return receipt requested). 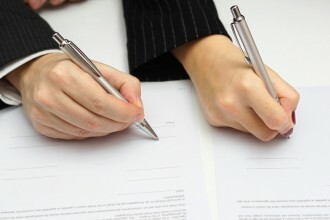 Who can serve – You can hire a professional process server or have a friend or family member serve the divorce papers. You, however, can NOT serve the papers to your ex yourself. Service timeframes – In general, there will be a window of 60 days (from the date of the initial divorce filing) within which the divorce papers have to be served to the other party. Who gets served – The ex or former partner has to be the person served with the divorce papers. The only exception to this is serving someone “of suitable age and discretion” who lives with the person to be served; if this occurs, proof that the person served lives with the other party in the divorce must be presented to the judge. Where to serve – The other party in the divorce can be served wherever (s)he can be located, including (but not necessarily limited to) his or her home, place of work, in a public place, etc. If the other party cannot be located – In the event that the other party in the divorce cannot be located, it can be possible to serve him or her via publication (i.e., publishing the notice in an appropriate publication for a minimum amount of time). In these cases, some specific rules will have to be followed in order for the court to consider the service as having been completed. Are you ready to move forward with a divorce? If so, it’s time to contact the trusted attorneys at Bahr & Kreidle. Since 1983, our Littleton divorce lawyer have been fighting on behalf of our clients, aggressively advocating their rights and interests in any legal setting. Our lawyers know how serious and devastating the impacts of divorce can be, and we know that achieving a favorable resolution can be pivotal to helping people move on with their lives. That’s why we are committed to providing our clients with exceptional personal service and the highest quality legal representation. To find out more about how we can help you, let’s meet for a free, no obligations initial consultation. To set up a meeting, call us at (303) 794-7422 or email us using the form on this page.